Ashton Gibbs won't have much time to make a decision that will determine the rest of his life. Gibbs, a sophomore guard at Pittsburgh from Scotch Plains, N.J., is one of 44 draft-eligible players who will work out this weekend in?front of coaches and personnel executives from 26 NBA teams at the Nets facility in East Rutherford, N.J.
At least Gibbs can give thanks that he isn't one of the players working out Sunday -- because by midnight Sunday underclassmen must decide whether they will remain in the draft or pull out and return to campus. NEW YORK -- In addition to his supersonic speed and killer instinct, it turns out John Wall may also possess a photographic memory. So says Washington Wizards coach Flip Saunders. "He's got an extremely high basketball IQ and it seems like he's got a photographic memory," Saunders said before Wall put up 19 points, six assists and five rebounds in the Wizards' 92-90 loss to the Knicks Sunday night at Madison Square Garden. NEW YORK -- John Wall's life will change forever Thursday night. Not only is expected to be the No. 1 pick in the NBA Draft by the Washington Wizards, but Wall's sneaker commercial will make its television debut during the draft. 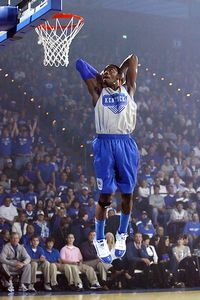 Here's Jonathan Givony's interview with Kentucky guard John Wall, the likely No. 1 pick in the upcoming NBA Draft. SECAUCUS, N.J. ? 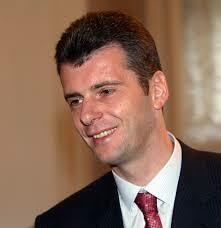 Mikhail Prokhorov looked a little like an Austin Powers villain even before the NBA draft lottery began. Once it was announced that Prokhorov and his Nets would not get John Wall with the first pick in the Draft, the brow of the Russian billionaire furrowed even more. LeBron & Wall Together in Jersey? Imagine John Wall furiously pushing the ball in transition and then dishing off to LeBron James on the wing for a windmill dunk to finish. If you're a New Jersey Nets fan, is this pure fantasy or is it within the realm of possibility? After their 12-70 finish last season, the Nets are in position to acquire both Wall and James to bolster their team as they begin a new era under the ownership of Russian billionaire Mikhail Prokhorov. The NBA Board of Governors on Tuesday approved Russian billionaire Mikhail Prokhorov?s acquisition of a controlling interest in the Nets. "We are pleased that the NBA?s Board of Governors approved Mikhail Prokhorov?s purchase of majority ownership of the Nets, welcoming into the NBA ownership ranks the league?s first majority investor from outside of North America,? said NBA Commissioner David Stern.? ?We anticipate that his passion for the game and business acumen will be of considerable value not only to the Nets franchise but to the entire NBA.? Prokhorov will become the NBA's first non-North American owner as well as the second-wealthiest owner in the league after Paul Allen of Portland. John Wall, the projected No. 1 pick in next month's NBA Draft, has signed with agent Dan Fegan of Blue Entertainment Sports Television, according to multiple reports. The 6-foot-4 Wall is seen as a transcendent personality who can captivate fans and also sell a variety of products, including sneakers. BEST will collaborate with another firm to handle Wall's marketing rights. Adrian Wojnarowksi of? Yahoo! Sports reported that LeBron James' fledgling marketing company, LRMR, was in talks to bring Wall aboard, but DraftExpress.com said LRMR will not be BEST's collaborative partner. The No. 1 high school prospect in the nation could be close to announcing his college choice, setting the dominoes falling for the top prep point guards. Brandon Knight of Fort Lauderdale (Fla.) Pine Crest on Wednesday told the Orlando Sentinel he plans to announce "sometime soon." The 6-foot-4 Knight lists Florida, Kentucky, Kansas, UConn, and Miami as his final five. NEW YORK -- Three years ago, I wrote a cover story for Slam magazine on four of the best high school guards in the nation -- Brandon Jennings, Jrue Holiday, Tyreke Evans and Lance Stephenson. The cover read, "Final 4 - Jennings, Holiday, Evans & Stephenson. Who's the best guard in the country?" Three years later, three of those four guys are in the NBA and the fourth, Stephenson, likely soon will be. Here's a video interview from ABC-WTVQ with Raleigh (N.C.) Word of God forward C.J. Leslie, who will be participating this weekend in the Dunkin Donuts Shootout National Classic at Lexington (Ky.) Catholic. The 6-foot-9 Leslie is a friend and former teammate of current Kentucky freshman sensation John Wall and sure sounds like he might follow Wall to Bluegrass country. Knight Next in Line at Kentucky? John Calipari has sent back-to-back guards to the NBA lottery and is working on a third. Is Brandon Knight next in line at Kentucky? The 6-foot-3 Knight, the top prospect in the Class of 2010,?has narrowed his list to four schools -- Kentucky, Kansas, UConn and Florida -- and will sign in the spring. NEW YORK -- From his seat in Section 85 in the lower level at Madison Square Garden, Nets President Rod Thorn had a bird's-eye view of every John Wall electrifying steal, jab step and thunderous dunk on Wednesday night. Wall scored 19 of his game-high 25 points in the second half, including a game-winning three-point play in the final seconds, to lead No. 4 Kentucky to a captivating 64-61 come-from-behind victory over No. 14 UConn in the SEC/Big East Invitational before a crowd of 15,874 at Madison Square Garden. Wall had six steals on the night, twice as many as UConn's entire team. Kentucky coach John Calipari got his second straight win over his rival Jim Calhoun of UConn. Read about their rivalry here.?? NEW YORK -- Nets President Rod Thorn is front and center here at Madison Square Garden tonight to watch the highly anticipated UConn-Kentucky game in the SEC/Big East Invitational. Kentucky freshman point guard John Wall is projected as the No. 1 pick in the 2010 NBA Draft and the Nets (2-19) currently have the worst record in the NBA, meaning they could land the top pick if the ping pong balls fall their way. "I?hope we make the playoffs," Thorn said with a smile. "Right now it looks like we'll probably be in the lottery someplace." Lance Stephenson didn't look 'Born Ready' in his college debut. The 6-foot-5 Brooklyn native started and shot 2-for-10 for 7 points in Cincinnati's season-opening come-from-behind 69-62 victory over Prairie View A&M. He was 0-for-3 from beyond the arc while adding 4 rebounds, 2 assist and 1 turnover in 22 minutes. Sometime on the evening of June 24, 2010, NBA Commissioner David Stern could well?utter the following words..."With the first pick in the 2010 NBA Draft, the Utah Jazz select John Wall of the University of Kentucky." Of course, the team that could really use Wall -- just named to the Bob Cousy Award Watch List -- and his transcendant abilities?is the New York Knicks. And the Knicks -- off to?a dreadful 1-8 start -- could well earn the right to select the 6-foot-4 Wall with the top pick. ?Several mock drafts project Wall as the No. 1 pick next year, ahead of Derrick Favors, Ed Davis and Greg Monroe. Kentucky freshman guard John Wall has been cleared to play by the NCAA. The 6-foot-4 Wall must repay nearly $800 in expenses and sit the first exhibition game against Campbellsville (Nov. 2) and the first regular-season game against Morehead State (Nov. 13). "I'm grateful to have this decision behind me. 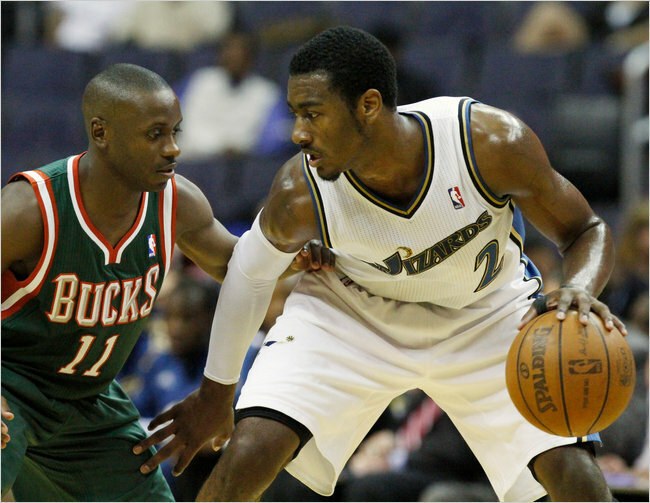 All I ever wanted was to go to school and play ball with my team," Wall said. "This has been really hard for my mom and I want to thank her for her support during this process." Senior forwards C.J. Leslie of Raleigh (N.C.) Word of God Academy and Terrence Jones Portland (Ore.) Jefferson both attended Kentucky's Blue-White scrimmage Wednesday night, according to various reports. Leslie, the No. 4 power forward in the Class of 2010, was supposed to attend Kentucky's Big Blue Madness last week but didn't attend. Seton Hall is hoping to get a visit from Leslie as well, but his camp has been very quiet about his plans. Kentucky freshman point guard John Wall is facing eligibility concerns because of his relationship with his former AAU coach, Brian Clifton, according to a report. Clifton, who coached Wall with the D-One Sports program and was with him in the summer of 2008 at the Steve Nash Skills Academy in New Jersey, was a former certified agent. "Those are amateur issues that arose prior to their coming to our schools," SEC Commissioner Mike Slive told Dana O'Neil and Pat Forde of ESPN.com in reference to Wall and Mississippi State freshman big man Renardo Sidney. "Those are strictly amateurism issues. As we told our people, somebody needs to determine if they are eligible. It's not relative to you, it's relative to them." When Midnight Madness?tips off?around the nation Friday night, many of the top New York-area prospects won't be in the Big Apple. They'll be?taking in the show at?Kentucky. "I'm excited, it should be good," said Dix Hills (N.Y.) Half Hollow Hills West forward Tobias Harris, who leaves Friday for Kentucky's "Big Blue Madness." Forget about that Jordan Crawford dunk on LeBron...this one by the Kentucky frosh beats it. This interview with Kentucky Coach John Calipari at the "Summer in the City" event is the third in a series of interviews with Division 1 head coaches conducted at camps this summer. NEW YORK -- John Calipari has yet to coach a single game at the University of Kentucky and already the expectations are sky high. After leaving Memphis in April, Calipari landed a recruiting class that many college basketball experts consider among the best ever assembled. UConn coach Jim Calhoun knows that the Kemba Walker Era in Storrs won't last forever. Walker, the former Manhattan Rice star, averaged 8.9 points and 3.5 assists as a frosh on a team that made the Final Four. If he has a big year this season paired in the backcourt with Jerome Dyson, it's possible that Walker could go to the NBA after his sophomore season. NEPTUNE, N.J. -- A little while back, a Division 1 coach from an East Coast school received a telephone call that caused him to perk up just a little bit more than usual. "I received a call asking if I was interested in a player and the call did not come from his high school coach or AAU coach, but rather from an agent," the coach recalled. The coach says he ultimately turned the player down, but the call reveals an inside glimpse into how college basketball really works. Xavier Henry may wind up at Kentucky when all is said and done. Henry, the 6-foot-5 shooting guard from Putnam City (OK) Putnam High, is having second thoughts about playing for Bill Self at Kansas and still could end up playing with friends for Kentucky coach John Calipari. "If it wasn't for his momma saying that 'I would not go to Kentucky, I would not move down to Kentucky,' Xavier would have been at Kentucky,'" Carl Henry told the Chris and Cowboy show on 610-AM in Kansas City. "He would have been at Kentucky. So Xavier says, 'I'm going to go to Kansas.' Even though that's what he wanted to do is go to Kentucky, play under Coach Cal. That's what he wanted to do. I expressed this to (Kansas) coach (Bill) Self. I told him." Could Xavier Henry be headed to Europe? Xavier and his father Carl Henry told the Kansas City Star that a month after Xavier committed to play for Kansas the family looked into a deal that would have sent Xavier to Europe next season. "You don?t have to take any classes,? Xavier told the newspaper. Rod Strickland knows a thing or two about being an elite point guard. Strickland was selected by the Knicks in the 1988 NBA Draft and enjoyed a stellar NBA career. Now he serves on John Calipari's staff at Kentucky, where he will help coach two of the top point guards in the nation next year in John Wall and Eric Bledsoe. 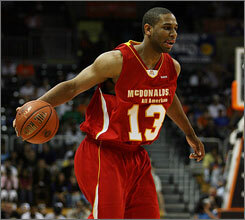 Jeremy Tyler will work out later this week in Los Angeles for Maccabi Haifa Heat of the Israeli pro league. "He's working out and people are coming in to see him," said grassroots basketball guru Sonny Vaccaro, who will broker Tyler's pro deal. "The Israeli team Haifa are going to be in Thursday and Friday to interview Jeremy and work him out." The 6-foot-11 Tyler initially committed to Louisville but then? announced he would skip his senior year of high school to play professionally for two years before entering the 2011 NBA Draft. **Memphis says it should keep its wins from Derrick Rose's year on campus and not forfeit its Final Four appearance. John Calipari's honeymoon at Kentucky sure didn't last long. Just a week after wrapping up what some consider among the best recruiting classes in the history of college basketball, the Memphis Commercial Appeal breaks the news that the NCAA is investigating Memphis -- Cal's old program -- for major violations during the 2007-8 season. The NCAA sent Memphis officials a letter alleging ?knowing fraudulence or misconduct? on an SAT exam by a player on the 2007-08 team. John Calipari has yet to coach his first game at the University of Kentucky and he is already a Big Winner. Just six weeks after moving to Kentucky from Memphis, Calipari has lined up a blockbuster recruiting class that should immediately make the Wildcats a potential Top 10, if not Final Four-type, team. When point guard John Wall signed with Kentucky earlier this week, he became the fourth five-star recruit to land in Lexington since Rivals began monitoring basketball recruiting in 2003. Kentucky coach John Calipari completed a blockbuster recruiting class with the commitment of John Wall, the No. 1 prospect in the nation. "Our relationship helped out a whole lot," Wall said Tuesday morning by phone. "It was a tough battle to the end, and just the relationship I had with Coach Cal and the other guards he had in the last two, three years, it gave them the edge. " Wall joins Demarcus Cousins, Daniel Orton, Jon Hood, Eric Bledsoe and Darnell Dodson in a tremendous recruiting class for Calipari, who left Memphis to take the Kentucky job. John Wall could be inching closer to a decision later this week. "He is still weighing options. End of the week it sounds like," said a source close to the situation. As I previously reported, Wall is believed to be down to Kentucky and Miami and will choose between those two schools. His advisor, Brian Clifton, told SI.com that Duke was also still an option. 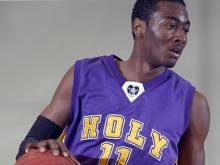 John Wall says he hasn't committed to Kentucky or anywhere else, despite a slew of rumors to the contrary on Thursday. "No, I haven't," Wall wrote Thursday in a text. A source at Kentucky also said the school did not issue any kind of ultimatum requiring Wall to choose a school within any time frame. John Wall is down to two schools -- Kentucky and Miami -- according to multiple sources close to the situation. "It's down to the two of them, no question about it," one source said. "It is Kentucky and Miami. The kid is leaning toward Kentucky. There is a little bit of a concern with the people closest to him that if he goes to Kentucky that they're going to lose control." Said a second source at one of the schools: "That's what we're hearing." Two big names will remain in the state of Kentucky next year. Kentucky sophomore Patrick Patterson will withdraw his name from the NBA Draft and will return to the Wildcats for his junior season. Also, Louisville says coach Rick Pitino is not interested in returning to the NBA. Recruiting expert Tom Konchalski talks Lance Stephenson, John Wall and Kevin Parrom. LANCE UPDATE NO. 1: A source within the Lincoln High school athletic department said the school is "planning a press conference at Lincoln within the upcoming weeks" to announce Stephenson's decision. Take that for what it's worth. No date has been set, and as far as we know Lance has still not made a decision. Things are quiet on the point guard front right at this moment. Eric Bledsoe, John Wall, James Beatty, Malcolm Armstead....even Jio Fontan. Eric Bledsoe knows where he wants to go to college, and he'll tell the world on Wednesday. "Yeah, he'll announce it Wednesday," Parker (AL) coach Maurice Ford said Monday by phone. The 6-foot-1 Bledsoe visited both Memphis and Kentucky this past weekend and has made his decision between the two. John Wall, the No. 1 recruit in the Class of 2009, has been charged with breaking and entering by Raleigh police, according to WRAL in Raleigh. Authorities said Wall, 18, was charged with misdemeanor breaking and entering in connection with an April 27 break-in at an unoccupied home in Raleigh. An officer saw Wall leaving from the rear of the house and detained him, police said. There was no forced entry and nothing was taken from the house, police said.